1. 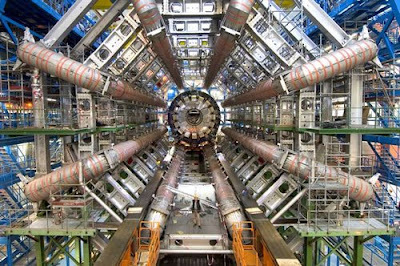 Why is it called the Large Hadron Collider? The first one is easy: Large because it is really big. The LHC is a large circular tunnel with a circumference of 27 kilometers (17 miles), buried in the ground under an average of 100 m (328 ft) of dirt and rock. In particle physics, hadron is a family of subatomic particles made of quarks and held together by the strong force*. Examples of hadrons are protons and neutrons. As you can guess from the name, the LHC uses mostly protons (with some ions) for its experiments. Lastly, collider because the LHC accelerates protons into two beams travelling in opposite directions and then collides them to see what particles come out. *There are four fundamental interactions: the strong force, the weak force, the electromagnetic force and gravity. Despite initial observations of the elusive metachlorian by Jinn, QG, et al (1999) Star Wars: Episode I - The Phantom Menace, the existence of "The Force" remains a controversial hypothesis unaccepted by most modern scientists. 2. Why is it underground? Well, that's because finding 27 kilometers worth of real estate above ground is really, really expensive. Actually, the LHC uses a tunnel originally dug for a previous collider (the LEP or the Large Electron Positron collider), which was decomissioned in 2000. All that dirt and rock also provide great shielding to reduce the amount of natural radiation that reaches the LHC's detectors. 3. Why is the LHC like a Werewolf? Both are affected by the Moon! Like tides in the ocean, the ground is also subject to lunar attraction. When the Moon is full, the Earth's crust actually rises about 25 cm (9.8 in). This movement causes the circumference of the LHC to vary by (a whopping) 1 mm (out of 27 km, a factor of 0.000004%) ) but that's enough so that physicists need to take it into account. 4. Why is the LHC like a Refrigerator? The Large Hadron Collider is not only a cool particle physics gizmo, it's also a very, very cold one. Indeed, it is the largest cryogenic system in the world and is one of the coldest places on Earth. To keep them at superconducting temperature, scientists have to cool the LHC's magnets down to 1.9 K (-271.3°C), which is lower than the temperature of outer space (-270.5°C). First, the magnets are cooled to -193.2°C using 10,000 tons of liquid nitrogen. Then 90 tons of liquid helium is used to lower the temperature down to -271.3°C. The whole cooling process takes a few weeks. 5. Who the heck is CERN anyway? In 1952, eleven European countries came together to form the European Council for Nuclear Research (Conseil Européen pour la Recherche Nucléaire in French, which gave it the acronym CERN). Two years later in 1954 it was renamed the European Organization for Nuclear Research, which would've given it the French name of Organisation Européenne pour la Recherche Nucléaire or the acronym OERN). Nobody liked "OERN", so the acronym CERN stuck. 6. How much does it cost, and who's paying for it? The Large Hadron Collider is nearly 30 years in the making - and costs the member countries of CERN and other participating countries an estimated €4.6 billion (about US$ 6.4 billion). Like those late night infomercials, however, we can say "but that's not all!" Extra things like detectors, computing capacity, and extra warranty (just kidding!) cost an extra €1.43 billion. The United Kingdom, for example, contributes £34 million per year, less than the cost of a pint of beer per adult in the country per year (Source). The United States contributed approximately $531 million to the development and construction of components for the LHC (with the US Department of Energy shelling out $450 million and the National Science Foundation kicking in the remaining $81 million). 7. How much electricity is used to run the LHC? It takes 120 MW to run the LCH - approximately the power consumption of all the Canton State of Geneva. Need a better comparison? 120 megawatt is equivalent to the energy used by 1,2 million 100 watt incadescent light bulb or 120,000 average California home. It's estimated that the yearly energy cost of running the LHC is €19 million. 8. How much data is expected from the LHC? To prepare for the deluge of data, CERN built the Worldwide LHC Computing Grid - sort of a super-fast, private Internet connecting some 80,000 computers to analyze the data (Source). 9. Okay, will the LHC spawn a black hole that'll eat my planet? Every time physicists come up with particle accelerators, party poopers come up with doomsday scenarios on how they will destroy Earth: black holes, killer strangelets, magnetic monopoles, and vacuum bubbles. Strangelets: These are strange matters that, like the Ice-nine in Vonnegut's novel Cat's Cradle, would turn all matters it touched into strange matters and eventually all of the planet will be transmuted into strangelets. The problem with strangelet doomsday scenario, besides being very bizarre, is that no one has ever seen a strangelet. It remains a hypothetical particle. Previous particle accelerators that operated at lower energy than the LHC were actually better candidates to producing strangelets, and so far, we're still here. Magnetic monopoles: These are hypothetical particles with a single magnetic charge (hence the name) - either a north pole or a south pole, but not both. Magnetic monopoles "eat proton." Actually, physicists have been looking for magnetic monopoles for a long time - and so far they've never found it. By calculations, magnetic monopoles are actually too heavy to be produced at the LHC. Vacuum bubble: It is actually a very interesting idea in quantum field theory. It states that life, the universe and everything aren't the most stable configuration possible. Perturbations caused by the LHC could tip it into the more stable state (called the vacuum bubble) and all of us "pop" out of existence. In all of these cases - if micro black hole, strangelets, magnetic monopoles, and vacuum bubbles were a problem to begin with, they would've been created by cosmic rays already. The continued existence of Earth and the rest of the universe tend to discount the validity of these doomsday scenarios. 10. How can I help? Well, although over 7,000 physicists are tackling the hard sciencey stuff, your computer can help! The LHC@home project lets you contribute idle time on your computer to help calculate simulations of the real thing.